It was a splendid showing as he won his fifth Masters, with his mother and children on the fringe of the 18th green to welcome him back to the arena of champions from which he had been forced out for over a decade. All great comeback stories in the world of sport have a dark underpinning ~ the intervening gloom that only enhanced the glory of regaining a spot that was earlier taken as if by birthright. 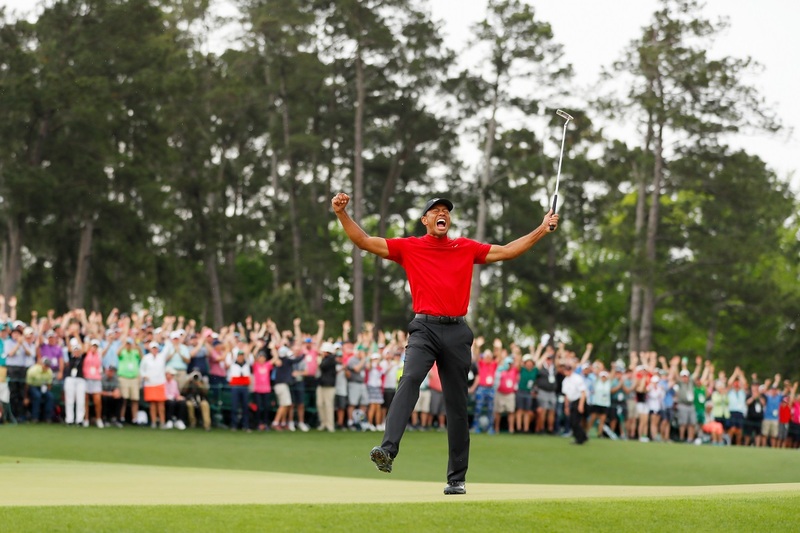 The pre-ecstasy agony through which Tiger Woods passed as his personal life and an overstressed back intervened for all of 11 years, only made sweeter his collecting a fifth coveted green jacket at Augusta on a Sunday afternoon. That had even the weather-gods smiling ~ the threatened stormy conditions that had forced an early start of the final round held off. There was no rain on Tiger’s parade as he picked up his 15th “major” title and once again re-ignited hopes of his winning three more “slams” and challenging the legendary Jack Nicklaus’ record of being the most successful golfer in the modern game. It was a splendid showing as he won his fifth Masters, with his mother and children on the fringe of the 18th green to welcome him back to the arena of champions from which he had been forced out for over a decade. And through a career spanning over 20 years, Tiger never wavered from his mother’s call to wear a red shirt for the final round ~ mothers have ever known what is best for their children. Yet it would be incorrect to assume that Tiger dominated the play at the Masters. Though surgery in his back facilitated a return to the top of the leader-board last year, bagging another major remained a dream even as he was tied second when the final three-ball teed off. Molinari and Koepka were the preferred choices of the gallery, many in the crowd felt that Woods had already “done enough” to keep his reputation intact. In some contrast to his younger days when he mauled his competitors into submission, a wizened Tiger opted for “percentage golf as he “plodded” ~ his own words ~ through star-studded company to ensure he made no mistakes. So when the closing stages neared, glory was in his sights. Like a true professional he assessed the situation, uncharacteristically played “safe” to tap in an unflamboyant shot to make the Tiger Woods story come alive after 11 years in the shadows. This was the maturity the champion had acquired in a career that was marked by brilliance, and some dark moments too ~ the human side of sporting prowess. Other sporting greats, Muhammad Ali, Roger Federer, Serena Williams, to name some, have all had their ups and downs ~ only the very best regain success. Tiger’s accomplishment is enhanced by his relishing the magic moment as Augusta on Sunday afternoon.